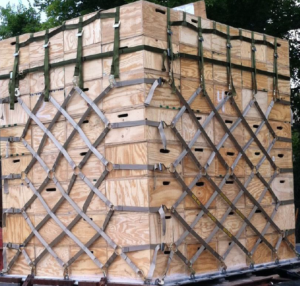 Norwegian Defence Logistics Organisation (NDLO) move to using the AmSafe Bridport (ASB) 1-piece Pallet Net, instead of the American Mil Specification (MIL-DTL-27444) 3-piece Pallet Net to gain many operational benefits. Numerous Nation’s for many years have used the ASB 1-piece Pallet Net as a modern alternative to the American Mil Specification 3-piece Pallet Net system (a top and 2 sides, P/N’s HCU-15/C and HCU-7/E). They have done this for various reasons; ease of use, quicker installation and removal of the pallet net onto the payload, logistics improvements with stocking of only one part, ability to secure irregular payloads with greater ease, potential to have a lighter weight pallet net, less moving parts so improved reliability, and ease of repair when required. 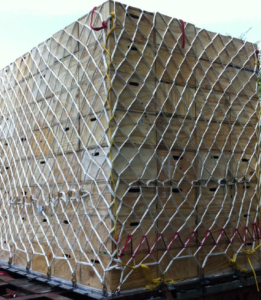 The NDLO have now made that same move following the testing and certification of the AmSafe Bridport range of 1-piece Pallet Nets by the USAF ATTLA for use on; C-130, C-17, and C-5, (copy of the ‘certification’ is available upon request). The NDLO now have the ASB 1-piece Pallet Net in service and are delighted with the benefits it provides. They use it on their C-130, but also the C-17 when they utilise the airlift capability provided by the NATO Airlift Management Programme out of Papa, Hungary. The AmSafe Bridport 1-piece Pallet Net is also used by operators on their; C295, CN235, A400M as well as the Chinook CH-47, and other similar fixed and rotary wing transport aircraft. “Internal restraint of cargo is a vital element of airworthiness, the cargo’s securement is vital to weight and balance and we are delighted to support operators who wish to consider an alternative to the 3-piece system that provides users with many operational benefits. 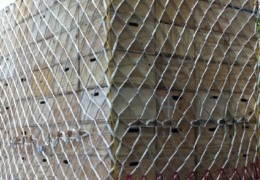 The NDLO are the latest Nation to move to our 1-piece Pallet Net for all the operational benefits they provide; we are delighted to have worked with the NDLO.” – said Joe Ashton, Cargo Business Unit Manager for AmSafe Bridport.